When Anderson Hardwood Flooring began developing Virginia Vintage hardwood flooring they were inspired by the sentimental objects in their homes and in the homes of their close friends and family. They began to think about what all of these homes had in common, they were crafted and cared for, but the homes histories were incredibly visible, textural and completely tangible. They all had imperfections making each object in the home one-of-a-kind, yet they all seemed to be part of an intricate network of underground artisanship. This crafted an understood eloquence that was obvious to everyone, even before you knew the history of the homes, you could see it. This was beauty, this was timeless. Wood made objects show their history well. You can see this in a single chiseled mark, or the slightest circular indentation from the head of a finishing hammer or even in the rough edging associated with a joint crafted with a handsaw. Anderson could visualize the craftsmen making their pieces of art that they lived in. Each one unique and each one organic, they could even hear the sounds of the town while the wood work was being crafted in their minds. This vision was taken and put into the works, and all of the sudden they were transported to another place in time. This they claim is the power of handcrafted hardwood. This quality is something that the machines of today just cannot pull off, they realized. So they ran with the concept, and created their richly textured, and pristinely hand scraped Virginia Vintage hardwood flooring. Throughout the history of hardwood flooring, styles have changed as technology began to progress. Simple hand tools were used by 18th Century craftsmen to transform rough forgettable planks of hardwood into regal hardwood floors. When the 19th Century came to fruition, industrial feats in the flooring industry gave way to belts of mechanical saws, leaving the hands of the wood artisans empty. Time still moved and began again in the 20thCentury resulting in remarkable cutting and surfacing practices and techniques. 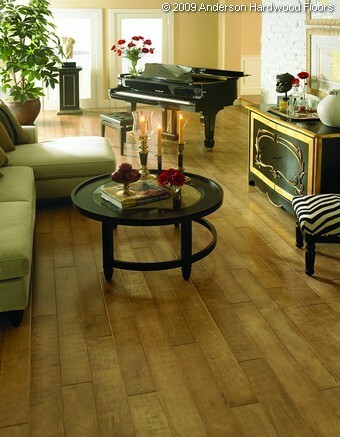 This produced unmatched quality and durability, compared to the hardwood flooring of the past. But in doing so, a dark cloud came to the hardwood flooring industry and took away the human touch that was needed to keep the traditional elements of these hand crafted floors. Once the human element was lost, the pieces became commercial and forgettable. Anderson Hardwood Flooring has reinvented the hand scraped hardwood floors’ history, by creating a product with all of the modern amenities but with the traditional qualities of the past. As a result we have Virginia Vintage hardwood flooring. This stunning collection of hand scraped perfection is simply the most striking that we have seen to date. Each detail was designed to highlight the natural grain of the hardwood planks. Maple and hickory have always been the front runners of our Nation’s hardwood flooring and because it is so these are the staples of this collection, keeping the historic charm without sacrificing quality. Both of these species have been celebrated in the flooring industry for there inherent beauty and durability. And once these wood species are scraped, they reveal additional dimensions and characteristics that are simply not present in today’s machine scraped planks. Anderson has hit an undeniable home-run with the Virginia Vintage collection. There is simply nothing comparable in today’s market. We would love to see what they have in store for us next, but right now we are happy to be able to enjoy a touch of historical elegance with all the modern attributes of today’s hardwood flooring technologies.